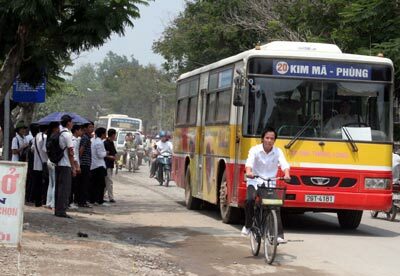 Travel by public bus has become popular in Hanoi now due to the cheap price and availability. Buses in Hanoi can be recognized by the typical cover with 3 main colors: white, red and yellow (see the picture below). Each bus has a number in red, centered in a white circle and made visible in the front sign of the bus.The price of a bus ticket in Hanoi is from 5,000 to 10,000 VND depending on the distances between the departure and the end point. Ticket will be handed out by a collector and you have to pay him in cash. If you plan to travel by bus, make sure you carry smaller bills. Hanoi public buses drop passengers in the stationary points on the streets, and fortunately many of them are located near or even in front of the famous and attractive tourism destinations in Hanoi such as Hoan Kiem Lake, The Old Quarter, Hanoi Train station (Ga Hanoi), Ho Chi Minh Mausoleum and The Literature Temple. #07 and #17: These two are the public buses that stop at Noi Bai International Airport, the most important gateway in the North of Vietnam. The #7 bus will cross the Thang Long Bridge and head to Cau Giay, while #17 buses go to the Old Quarter via Chuong Duong Bridge. #33 or #02: These buses will bring you to the area near Ho Chi Minh Mausoleum and from those areas, you can wander along the tree-filled boulevards like Dien Bien Phu or Le Hong Phong, before heading to Ho Chi Minh Complex. #09: This bus will drop you at Hoan Kiem Lake and from that point, you can explore the lake’s areas and the Old Quarter on the downtown. These buses also stop at some checkpoint in Le Hong Phong and Dien Bien Phu Str., so that you can visit the Ho Chi Minh Mausoleum and the areas nearby. However, the problem you might encounter while get on a bus is that it is very crowded at peak hours. You should always keep one hand to cover your purses or place your backpack at the front, since crowded bus in Vietnam is an ideal place for pickpockets. Also, as the bus approaches your intended destination, try your best to make the way to the back door, take a deep breath and prepare for a fast move because bus drivers in Hanoi are notorious for stopping at a stop for a very short time. You will need to be prepared to get out of the bus as fast as you can if you don’t want to miss the point. If you are unsure when to get off, ask either the driver, the ticket collector or the fellow passengers. As intimidating as it sounds, travelling by bus in Hanoi is a truly local experience.